While soda offers no nutritional value, you may be surprised to learn that most fruit drinks are as bad, or possibly worse for your health than drinking soda. 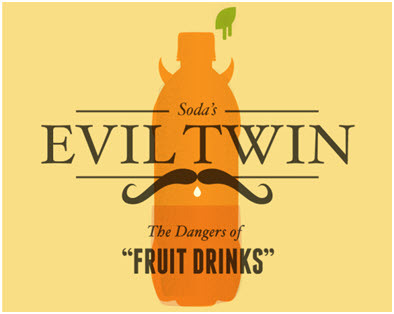 In fact, some fruit drinks pack more sugar per serving that a can of coke that has roughly 10 teaspoons of sugar! Soda takes a lot of heat from the health science community. With astronomical levels of sugar and calories and no nutritional value whatsoever, health experts commonly equate it with poison. Yet the big beverage companies themselves are starting to leverage this public perception of soda in exceedingly insidious ways. Namely, they are producing an alternative to soda that is supposed to be healthy: the “fruit drink.” Often shelved next to soda, fruit drinks appeal to the health conscious individual that still wants something sweet. Ditch the Coke, and grab a Snapple, they say. Unfortunately, the people who do this are unknowingly falling into the trap that Big Beverage has set for them, because fruit drinks are, on average, no healthier than soda. In fact, they’re often even less healthy, with more sugar and calories and negligible amounts of actual fruit juice. So the next time you’re in the beverage aisle, beware the fruit drink. It’s merely soda in disguise.